Note: As you can see with this post, I’ve stopped posting my writings in parts. I’d rather post the whole writing at once, which admittedly might make for some long posts. I hope you all enjoy these writings nonetheless. I may go back to posting in parts if/when it seems necessary, but this is the way I’ll keep it for now. Located near St. Louis in Collinsville, IL, the Cahokia Mounds are a set of ancient earthen mounds often credited to Native Americans who were known as the ‘Mound Builders’. The Mound Builders were ancestors of the natives alive at the time of the first settlements, and they’re believed to have been more advanced and intelligent than their descendants. Native tribes reportedly attributed the mounds to their ancestors, the Mound Builders, which hints at an interesting erased chapter in North American history. We have no real way of knowing who the Mound Builders were or how they constructed so many impressive earthworks, and for now, we can only guess. The largest of the Cahokia Mounds is known as Monk’s Mound and stands at over 100 feet high and 775 feet wide. Modern day Monk’s Mound. A road cuts through the Cahokia site, but visitors can ascend the staircase that leads to the top of the 100 ft. mound. The name was given to it because of French Trappist monks who farmed it in 18091, well after the civilization responsible for the mounds had abandoned them. I live near the mounds, and to me, the most fascinating thing about them is how little we know about them or the civilization that built them. Because of the complex manner in which they were designed, historians and archaeologists are still baffled about their origin. Theories abound, from gods appearing and building the mounds to the more common theory that an ancestor Mound Builder race is responsible. The only way we could really know, besides through extensive excavation and research, is if we took a step back in time and witnessed their construction. Troy Taylor at Prairie Ghosts writes that relics from the Mound Builders are scattered across the United States1. Cahokia wasn’t the only ancient American civilization to build mounds, but theirs are among the most notable – especially Monk’s Mound. Early explorers took these strange manmade mounds as signs of the presence of an advanced civilization that had long vanished1. Plenty of artifacts were left behind, including pottery, beautiful stone pipes and copper effigies of birds and serpents1. It didn’t take long for theories to be proposed about who built the mounds. Some claimed they were the work of Vikings1, some Phoenicians from Tyre, an ancient city1, and some the lost tribes of Israel1. As I mentioned, the natives themselves attributed the mounds to a great civilization that had come before them. This could explain why so many interesting theories exist about who built them; wild theories are inevitable with any mystery. Perhaps the settlers weren’t satisfied with the natives’ explanation and felt there was another, more mystical force at work, or perhaps the natives were right and a more intelligent race – their ancestors – built the mounds. In 1839, ethnologist Samuel G. Morton produced evidence that skulls retrieved from the burial mounds matched the skulls of recently deceased natives1. This effectively linked the ancient Mound Builders with the natives who were still alive at the time. Morton theorized that the Mound Builders were early ancestors of the natives1. Until 1881, his theory was largely rejected1. It was finally accepted when the Smithsonian Institute started a special investigation into the mounds1, which was led by Illinois archaeologist Cyrus Thomas, a critic of Morton’s theory and advocate of the lost race theory1. After examining thousands of unearthed artifacts over a period of seven years, Thomas changed his stance and accepted Morton’s theory that the Builders were the natives’ ancestors1. Troy describes Monk’s Mound as a 16-acre stepped pyramid that shows signs of having been rebuilt several times1. Buried remains of an ancient temple sit just under the mound’s summit1. Personally, I’d love to explore them just to see what I could find. Cahokia was larger than London in its heyday1, but besides locals and tourists who come to check it out, it’s empty today. Fortunately, Monk’s Mound is preserved along with a few others and you can visit them at the Cahokia Mounds State Historic Site, where you can also visit a wonderful museum. 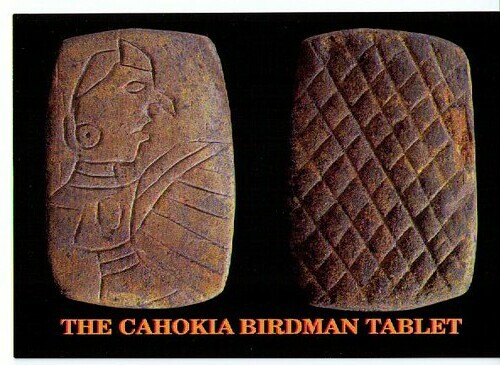 Approximately 20,000 people once lived in the city of Cahokia1, and they lived inside of a wooden stockade that surrounded their homes, buildings and main mounds1. The city thrived from 700 AD until reaching a steady decline around 13001. It had been abandoned by around 15001. There used to be more than 120 Cahokian mounds scattered throughout the land1, but many have been destroyed over the years. Only 106 have been recorded1, but thankfully, 68% of them are preserved inside the boundaries of the State Historic Site1. According to some archaeologists, the Natchez Indians of the Lower Mississippi Valley were the last surviving descendants of the Mound Builders1. They worshipped the sun1, which could explain the mounds’ ritualistic purpose as well as the Woodhenge built on the site1. Cahokia’s Woodhenge consists of 48 wooden posts that make up a 410 ft. diameter circle1, and it can determine the exact date of all four equinoxes by lining up the central observation posts with specific perimeter posts during the sunrise1. Some have suggested that the Mound Builders abandoned their civilization because of overcrowding and a lack of food or other resources1, as well as contamination of the water supply1. Others have theorized that a complete breakdown of the Cahokian civilization was to blame1. The Natchez, perhaps the last descendants of the Mound Builders, were already severely declining when the first settlers arrived1. The French would eventually wipe them out completely during a series of wars along the Mississippi1. If the genocide of an entire tribe of people weren’t bad enough, this particular tribe was our only potential link to the Mound Builders. The Mound Builders: An Ancient, Highly Intelligent Race? After researching a nearly century-old newspaper article posted to Facebook by Beverly Bauser, Coordinator for Madison County IL GenWeb, I was pleasantly surprised to find that the history of my community is closely linked with the history of Cahokia. As I mentioned, my town is a short drive from the Cahokia Mounds. The small, tight-knit towns that comprise my community are all refinery towns, built up by Standard Oil in the early 1900s. Smaller outlying mounds have been discovered here throughout the past few hundred years, and one such mound still stands perfectly accessible in a public park here in Roxana, IL. A number of these mounds that used to stand in my community were eventually dug up. One dig uncovered something strangely absent from history books, leaving one to wonder why kids across the country were never told about it in school. The year was 1918. During construction of an oil refinery in Roxana – one of many that still operate here – the crew started digging at a mound which sat on newly purchased refinery property planned to be used for employee housing2. While digging, the crew reportedly uncovered skeletons that could’ve only belonged to a highly intelligent ancient race2 because the skeletons were noticeably different from those of the natives at the time2. 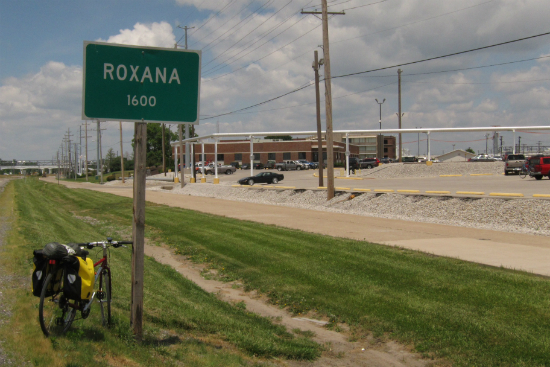 The refinery property in Roxana, IL, where the bones were discovered. 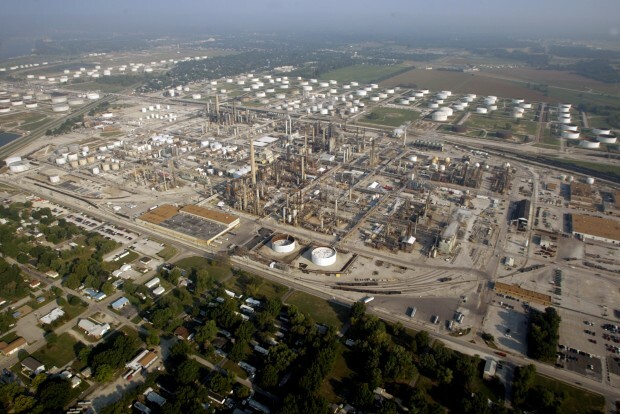 I grew up near this refinery, and I still live near it. I see it almost every day along with about three other refineries. The site where this took place, gated refinery property, just happens to be across the street from the public park with the aforementioned accessible mound. This fascinates me because this mound was in my hometown and, again, the refinery they were constructing is in use today. Hardly any more information can be found about the discovery beyond what was offered in my source, the 1918 newspaper articleobtained by Beverly Bauser. Legend tells of a ‘bearded and robed god’ visiting the civilization known as the Mound Builders and building massive mounds while inspiring them to live in love and harmony with the land1. It also tells of an eventual degeneration within the culture; they soon descended into war and ritual sacrifice1. Despite that the history behind them is mostly unknown, the Cahokia Mounds are believed by many to be a source of powerful energy1. Because of this, more than a thousand people gathered at the top of Monk’s Mound in August 1987 for the harmonic convergence, a global meditation event that coincided with a powerful planetary alignment1. The event was designed to spread peace across the world1. Now, we’ll take a look at an 1899 article from a local Illinois newspaper, The Alton Telegraph, which reports on the death of the then-current owner of Monk’s Mound and shares some history. Once again, I would’ve never found this old article if it weren’t forMadison County IL GenWeb Coordinator Beverly Bauser, who recovered it and posted it to their Facebook page with a historical picture and drawing of the mounds. The article explains the owner’s belief that the mounds were constructed by ‘a people with a much higher order of intelligence’3. It begins by informing readers that the funeral of the mound’s owner, Hon. T.J. Ramey, had taken place that day3. Ramey was described as the ‘agent of a number of scientific institutions’3, and the article explains that he had been ‘digging and delving’ into the mound to produce results he intended to be posthumously published3. He often claimed that the natives of his time weren’t involved at all with constructing the Cahokia Mounds or any throughout the country3. He also believed the mounds were intended for various purposes beyond burial3. He knew the builders had profound knowledge of geometry3, because the figures on the inside are built on geometrical lines3. The 1899 article describes Monk’s Mound as bearing resemblance to the Egyptian pyramids3, because within it lie terraces, rooms, halls and various other wonders that all contain ancient relics3. Ramey was able to prove that Monk’s Mound wasn’t built from earth taken from nearby adjacent hollows or low places3; the thousands of tons of inside material were somehow brought from bluffs miles away3. Bluffs can be found near Alton, IL, which is near my town but far enough away from the Cahokia Mounds to make you wonder how the material was transported. It’s assumed that the material was sent on the river in boats – despite Alton being far from the mounds, all it would take to get there is a boat ride on the Mississippi. The river was a lot wider back then3, and this probably made it easier to transport the materials by boat. However, the fact that limestone from the bluffs was added to the mounds at all is, in my opinion, fascinating. Ramey was once offered $100,000 for the tract on which Monk’s Mound stands, but he refused because his work was not yet done3. He wouldn’t let the mound pass into anyone else’s hands for any amount of money as he was well-off and too deep into his work with the mound to give it up3. He firmly believed his investigations into Monk’s Mound would go down in history and create a monument to his memory that would ‘last longer than any gravestone’3. Again, he also asked for his findings not to be published until after his death. He requested his findings be reviewed and edited by the ‘highest scientific institutions of the country’ once he was gone, before being released to the public3. One can only imagine the kind of editing that took place once those institutions got their hands on Ramey’s findings, and his well-meaning request could be the reason we don’t know more about the mounds today. I highly recommend checking out the Cahokia Mounds if you’re interested in mysterious ancient structures with an unknown history. You can visit the mounds and stand atop the massive Monk’s Mound, and if you do, take some time to ponder the mystery behind this ancient site. Climbing up the steps up to the top of Monk’s Mound and looking out over the land from the top is an experience you won’t forget, and while you’re there, consider the fascinating discoveries that have yet to be made. The mounds boggle the mind and the history behind them is as cloudy as the rest of North America’s ancient history, which makes them all the more appealing to seekers of truth and lovers of mystery. “Roxana: Skeletons of Intelligent Race Found” Newspaper article from the Alton Evening Telegraph, May 11, 1918. Obtained by Beverly Bauser, Madison County IL GenWeb Coordinator: http://madison.illinoisgenweb.org/. Posted to theMadison County IL GenWeb Facebook page:https://www.facebook.com/madison.ilgenweb/posts/1061869140518431. Used with permission. “Monk’s Mound Owner Dies – Interesting History Recalled” Newspaper article from the Alton Evening Telegraph, June 28, 1899. Obtained by Beverly Bauser, Madison County IL GenWeb Coordinator: http://madison.illinoisgenweb.org/. Posted to the Madison County IL GenWeb Facebook page:https://www.facebook.com/madison.ilgenweb/photos/pcb.1095242240514454/1095239557181389/?type=3&theater. Used with permission.